In about 1851 the village of Darlington was created and named by Samuel William Lewis, the licensed victualler of the Flagstaff Inn, after the market town in County Durham in North East England named Darlington. Lewis was the licensed victualler of the Flagstaff Inn during these years 1848-1853 - 1858 - 1860-1864. Lewis was a stone mason by trade and he was contracted to erect the first two public memorials in the colony. The first was a memorial to Colonel William Light erected in 1843 over the site of his grave in Light Square. The second was the monument to Matthew Flinders at Stamford Hill near Port Lincoln in 1844. ^ Australian Bureau of Statistics (25 October 2007). 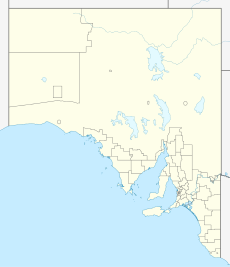 "Darlington (State Suburb)". 2006 Census QuickStats. Retrieved 28 March 2011. ^ Bowden, Tom (9 October 2013). "The A-Z story of the history behind Adelaide's suburbs". The Advertiser. Retrieved 27 July 2016. ^ a b "Darlington". Property Location Browser. Government of South Australia. 7 January 2010. SA0017954. Retrieved 27 July 2016. ^ "Adelaide Park Lands and Squares: Light Square Report" (PDF). Adelaide City Council. Adelaide City Council. 29 October 2007. Retrieved 27 July 2016. This page was last edited on 11 April 2019, at 04:16 (UTC).